A man described by Evans-Pritchard as an 'Anuak-Nuer' i.e. 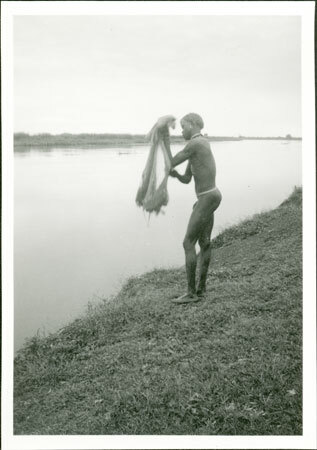 of mixed parentage, preparing to cast a fishing net into a river, probably the Sobat River near the wood station also photographed on the same film. Evans-Pritchard has presumably noted the youths origins since net fishing was not practised by the Nuer, preferring the harpoon. Morton, Chris. "Fishing in Sobat River" Southern Sudan Project (in development). 03 Jan. 2006. Pitt Rivers Museum. <http://southernsudan.prm.ox.ac.uk/details/1998.355.751.2/>.